The new ferry boat between North Korea and Russia, arriving in Vladivostok last month. The ferry service comes as local businesses have started to use North Korean workers for low-cost labor. VLADIVOSTOK, Russia — Across Western Europe and the United States, immigrants from poorer countries, whether plumbers from Poland or farmhands from Mexico, have become a lightning rod for economic anxieties over cheap labor. The Russian city of Vladivostok on the Pacific Ocean, however, has eagerly embraced a new icon of border-crushing globalization: the North Korean painter. Unlike migrant workers in much of the West, destitute decorators from North Korea are so welcome that they have helped make Russia at least the equal of China — Pyongyang’s main backer — as the world’s biggest user of labor from the impoverished yet nuclear-armed country. The work habits that delight Vladivostok homeowners are also generating sorely needed cash for the world’s most isolated regime, a hereditary dictatorship in Pyongyang closing in on a nuclear weapon capable of hitting the United States. Just last week, the North reached a milestone by testing its first intercontinental ballistic missile. Squeezed by international sanctions and unable to produce many goods that anyone outside North Korea wants to buy — other than missile parts, textiles, coal and mushrooms — the government has sent tens of thousands of its impoverished citizens to cities and towns across the former Soviet Union to earn money for the state. Human rights groups say this state-controlled traffic amounts to a slave trade, but so desperate are conditions in North Korea that laborers often pay bribes to get sent to Russia. North Korean laborers helped build a new soccer stadium in St. Petersburg to be used in next year’s World Cup, a project on which at least one of them died. They are working on a luxury apartment complex in central Moscow, where two North Koreans were found dead last month in a squalid hostel near the construction site. They also cut down trees in remote logging encampments in the Russian Far East that resemble Stalin-era prison camps. But they have left their biggest and most visible mark in Vladivostok, providing labor to home repair companies that boast to customers how North Koreans are cheaper, more disciplined and more sober than native Russians. “Surprisingly, these people are hard-working and orderly. 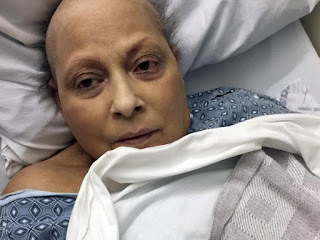 They will not take long rests from work, go on frequent cigarette breaks or shirk their duties,” promised the website of a Vladivostok company. The home repair industry stands at the more benign end of North Korea’s labor export program. Painters and plasterers are not generally subjected to the brutal mistreatment endured by North Koreans working in Russian logging camps or on construction sites. All the same, they still suffer from what human rights groups say is a particularly egregious feature of Pyongyang’s labor export program: Most of their earnings are confiscated by the state. The human rights group estimated that the North Korean authorities earn at least $120 million a year from laborers sent to Russia, a vital source of income for a family dynasty founded, with Moscow’s backing, by Kim Il-sung in 1948 and now headed by his 33-year-old grandson, Kim Jong-un. It put the number of North Koreans working in Russia at nearly 50,000, though other studies say the number is 30,000 to 40,000, which is still more than in China or the Middle East, the other principal destinations. The Russian boss of a Vladivostok decorating company that employs scores of North Koreans said the amount of money seized from salaries had increased substantially over the past decade, rising to a current monthly rate of 50,000 rubles, or $841, from 17,000 rubles a month in 2006. He said his highest-paid workers now lose half or more of their monthly salary through confiscation, while the leader of each construction squad of around 20 to 30 laborers takes an additional cut of about 20 percent in return for finding painting jobs for his men. The Russian asked that he not be identified because he feared that Workers’ Party supervisors would punish his laborers or prevent them from working with him. The increased rate of confiscation followed a sharp fall in the value of the ruble against the dollar, a troubling development for a regime that wants dollars, not rubles. But the jacking up of the amount of rubles seized more than compensated for the ruble’s fall, reflecting Pyongyang’s desperate hunt for more cash since Kim Jong-un took power in December 2011 and ramped up North Korea’s missile and nuclear programs. International sanctions and a Chinese ban on imports of North Korean coal in February after a series of missile tests have steadily squeezed Pyongyang’s other sources of foreign revenue. That has left the export of labor, along with a string of state-run restaurants and other small businesses in Vladivostok and elsewhere, as one of the regime’s shrinking list of ways to generate hard currency. 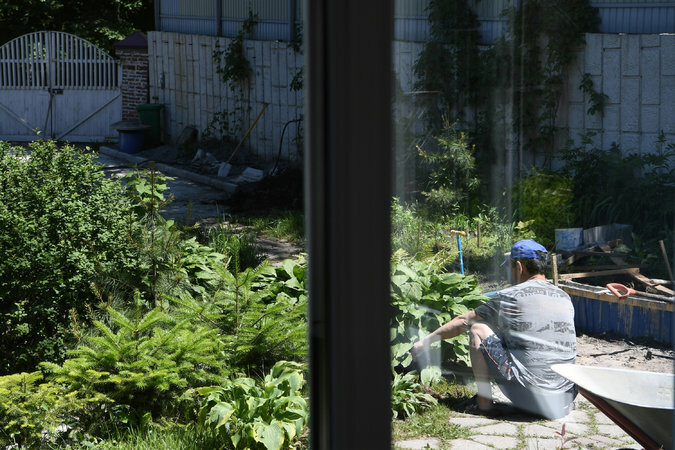 To prevent them from seeking refuge in South Korea, North Korean laborers are forced to live together in cramped dormitories scattered around the outskirts of Vladivostok and prohibited from contacting Russians and other foreigners outside work. The boom in North Korean labor exports to Russia coincides with an expansion of other links between the two countries, including a recent surge in Russian coal exports and the start in May of a new ferry service twice a week between Vladivostok and Rason, a special economic zone on the east coast of North Korea. In April last year, just months after North Korea announced that it had tested a “miniaturized hydrogen bomb,” Russian and North Korean officials gathered south of Vladivostok to celebrate the reopening of Kim Il-sung House, a wooden building dedicated to the memory of the dictator. It had been rebuilt, at Russia’s expense, after a fire. 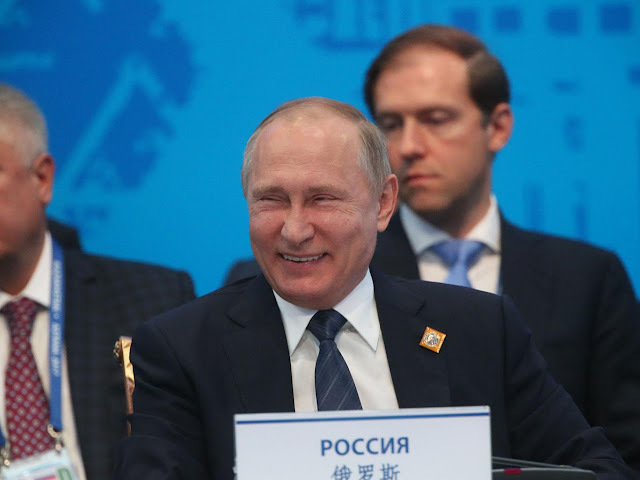 The links with Russia are still far less extensive than those North Korea has with China, its principal foreign backer, and do not appear to violate sanctions imposed — with the Russian government’s support — by the United Nations. But they have nonetheless raised eyebrows in the United States and Japan, which want to tighten the economic and diplomatic vise on Pyongyang. Russian coal exports to North Korea more than tripled to $28.4 million in the first quarter of this year from $7.5 million in the same period in 2014, indicating that Moscow would most likely object to any efforts by Washington to widen United Nations economic sanctions. Why North Korea would sharply increase coal imports is a mystery, as it has plenty of coal. 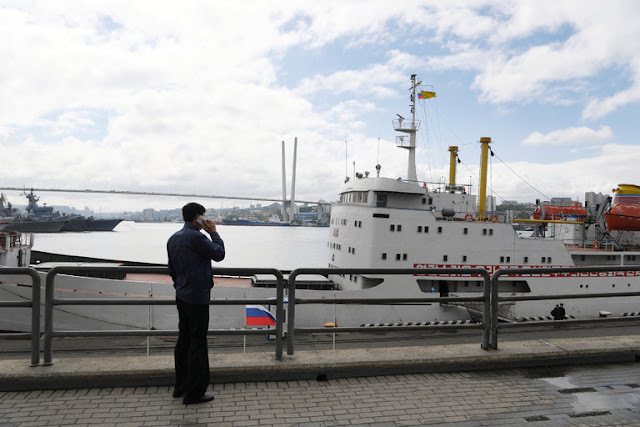 A bigger mystery is the business rationale behind the new ferry service to North Korea, started last month by a private Russian company, InvestStroyTrest, at a time when few Russians want to travel to North Korea and even fewer North Koreans, aside from laborers, visit Russia. When the ferry, the Mangyongbong, docked in Vladivostok last week from North Korea it had just six paying passengers. It has berths for 193. Mikhail Khmel, the deputy director general of InvestStroyTrest, said that “all the noise around North Korea that makes people afraid” was to blame for the slow business. The ferry service only expands existing transport links between North Korea and Vladivostok, the only foreign destination other than Beijing and the northern Chinese city of Shenyang for Pyongyang’s national airline, Air Koryo. Each Friday, skinny North Korean laborers in ragged clothes, watched over by supervisors in suits with Kim Il-sung badges, gather at Vladivostok airport with piles of luggage before a weekly flight to and from Pyongyang. While presenting a miserable tableau of deprivation at the airport, North Koreans who have worked as laborers in Russia often are eager to come back. Indeed, the Russian decorating company boss said, they often pay bribes to officials from the Workers’ Party to gain an assignment to work abroad. One of these is a 52-year-old painter now on his second five-year assignment to Russia. Speaking broken Russian as he painted Ms. Kravchenko’s bedroom wall, he said that he liked the work and the opportunity to earn foreign money for himself and his country. While in Russia, he goes by the name Dima, short for Dimitri. He said his Russia work permit expires next year and he will have to go home. “I hope I can come back,” he said. All the same, he added, North Koreans still want to work in Russia, where, despite the hardships and confiscation of a big chunk of their wages, they can live better and freer than they do at home. “It is not slave labor but hard labor. And it is much better here than in North Korea,” Georgy Toloraya, a former Russian diplomat in Pyongyang, said.